You know that saying about something is attracted to something like bees are attracted to honey? Unless you’ve actually extracted honey, you couldn’t possibly know just how attracted to honey they really are. Bees smell honey. Then they go tell their friends where to find the honey…and they tell their friends…and they tell their friends…and within minutes the driveway, the garage, the pool, the entire front yard is enveloped in bees, like something out of a horror movie. Then the hubster is unhappy because he can’t in the pool because it’s surrounded by bees, and I need to get the bees out of the garage…and don’t let them in the house cause the cats will chase them and get stung…then I’m pulling out the hose to squirt the bees away and wash the honey smell off the floor, the driveway, anything and everything’s that’s come in contact with the honey. Not to mention, I kick into rescue mode and start fishing the little buggers out of the pool. All of this is hypothetical by the way :o) Next year we’ll sneak everything out of the garage and into the workshop around midnight when the bees are sleeping. The hardest part of extracting honey is not letting the bees know you’re doing it. Stealth is key. I learned my lesson last year, escaping with uncovered boxes down to the garage and leaving them outside for even a few minutes and attracting hoards of bees that hovered outside the garage door all day. Based on that experience, I improved my process this year. In fact, I was quite pleased with myself and how I managed to bypass the drama that we experienced last year. At least until the hubster opened the garage door the next day while the honey boxes and some leftover honey were sitting on the garage floor. Not to mention, they smelled the remnants from the day before. Bees are smart! But getting back to extraction day, I actually came up with a good process. Not a perfect process, but a good one. Think smart. Preparation is key. Get the tools and brush ready, get the fume board ready, get a wheelbarrow ready, get top covers ready, have the smoker going, get the gear on, and have a completely enclosed facility ready to house the honey. 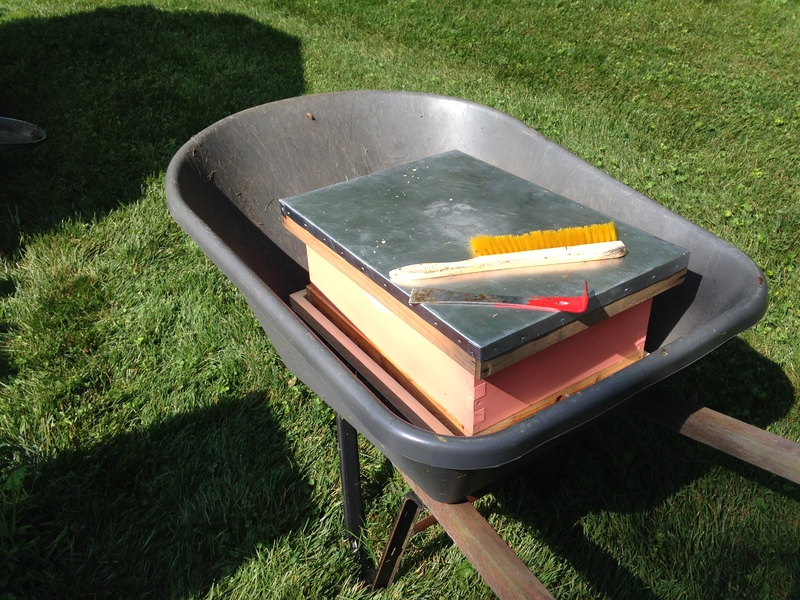 Put a top cover top side down in the bottom of the wheel barrow. Lightly smoke around the top edges of the hive and at the entrance to let them know you’re coming in. But not too much. You don’t want to smoke in the honey. Spray the fume board 3 times with the almond scented fuming spray, and place the board on top of the hive. Wait 5 – 10 minutes for the bees to clear out. Most of the bees should bee out of the top box by now, so remove the top box and place it within the top cover that’s in the bottom of the wheel barrow. Immediately place another top cover securely on top of the honey box so that it is completely closed on the top and on the bottom. 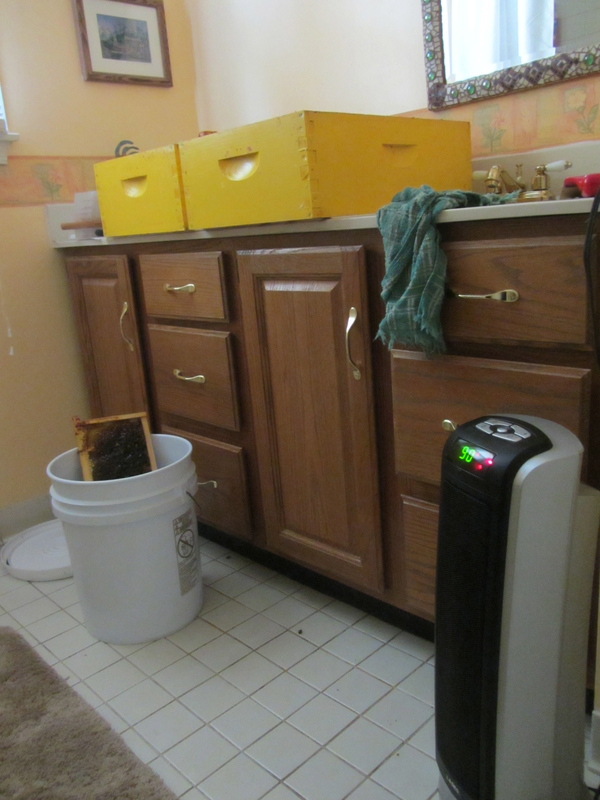 Spray the fume board one or two more times, then place on top of the next box to bee removed. While the fume board empties the next box, quickly run your honey super down to the garage or where ever you’re extracting. Life the lid and brush off as many bees as possible – what’s left will go into the garage with you along with the honey box. Close the door behind you!!! If successful, then you’ll have all honey supers safely in the garage, with a small amount of bee activity outside the door, and a small amount of bee activity inside the garage. It’s gonna happen, some bees will bee caught up with the honey boxes. Don’t open the garage door to let them out. TRUST ME on this. 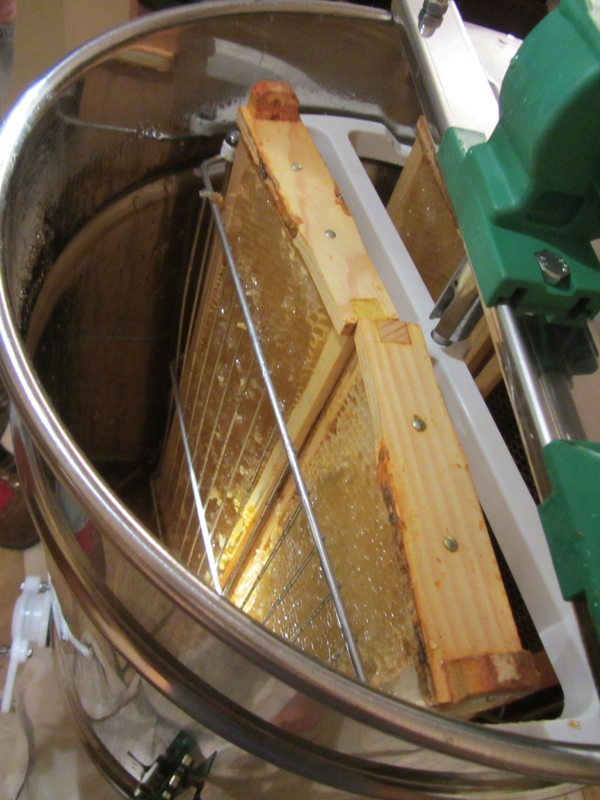 We extracted over 100 lbs of honey this past weekend. That’s from about 5 boxes. Amazing bees! So how have the girls been doing up to this point? Well, other than finding bee activity in my swarm traps and discovering (after purchasing a new hive, new beekeeping britches, and setting up a new hive location) that they were not swarms but robber bees, we haven’t had much drama. They’ve endured much rain, and much heat and humidity this summer. I’ve left them alone, and they’ve been thriving (that should tell you something right there). And so has the garden. We have cucumbers coming out our ying yangs, and tomatoes are coming up fast. In the meantime, I’ve placed supers back on all the hives, and even added a third box to my little yellow hive, which is still taking syrup and is growing like crazy. Let’s hope the big hives fill out and cap some unfinished frames and build out the rest of the supers before winter. Trying to follow that 90% rule – only extract frames that are 90% capped. We can use some late summer honey for overwintering the bees, and maybe they can spare a bit more for us. We shall see! During my 1st year beekeeping presentation, someone asked me about the supers on my hives. I told them they weren’t supers. Up to that point, I didn’t think of them as supers. I was allowing the bees to create sugar syrup stores for winter, but not honey for harvesting. When in fact, they are supers without a queen excluder – and the bees built up quite the stash. So what to do with the stash? My answer – extract it and feed it back to the bees, for a number of reasons. It’s healthier for the bees to feed from their own food vs. sugar. The bees will clean up the wet drawn frames so I can reuse them. I’d rather practice extracting for the first time using sugar syrup than the real honey. I don’t have the freezer space to store the frames and I can’t keep them outside forever. I can store sugar syrup in the fridge. And best of all – I have an excuse to buy an extractor! The boxes I took were from my dead yellow hive. I purchased a complete extracting kit from Brushy Mountain. 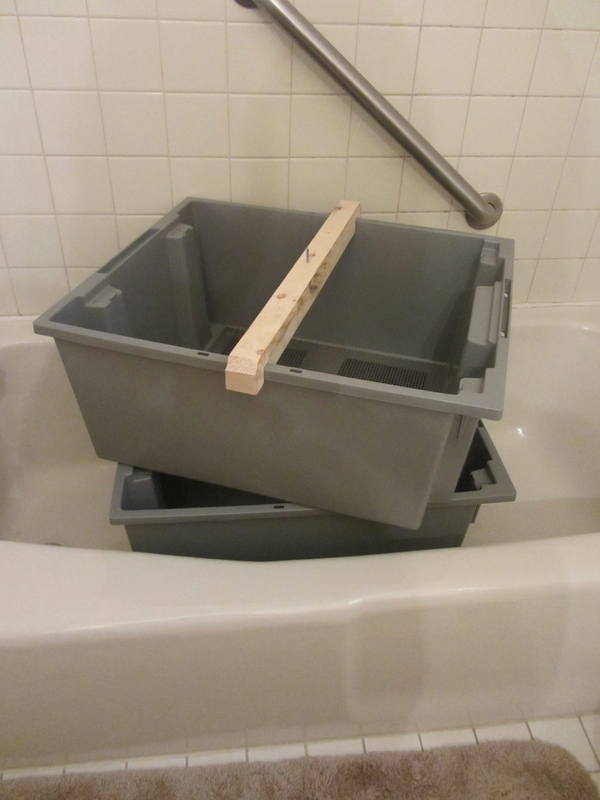 It included the tools, the extractor, the uncapping tank, and a straining bucket. I thought about waiting a week, but was so excited that I decided to start that day. I moved the uncapping operation into our guest bathroom, and the extracting operation in the kitchen. Everything gets sticky – the floor, the door knobs, the cats. Keep a wet towel handy to clean your hands and wipe things down as needed. The pitcher of hot water is for the capping knife. Store the knife in the water when its not being used to clean the honey off the knife and warm it up (unless you have an electric knife) to help cut through the wax easier. Be sure to wipe the water off each time so you don’t get water in the honey. You don’t want ANY excess moisture in your honey. Although its not as big a deal when working with sugar syrup. But start good habits early. I uncapped 16 frames. Initially I was bending over. Uncapping frames one after another is physical work. After 3 or 4 frames, my back got the hint and I elevated the tank so I could stand upright while uncapping. Trust me on this. Those uncapping knives are huge. I used a Pampered Chef bread knife and it worked great. For the small missed spots, I used an uncapping tool, and I also kept a fish knife handy for areas that were hard to reach with my larger knife. Beekeepers always seem to uncap from the bottom up. I’m not sure why, but for me, the cuts are thinner, cleaner and smoother. Top down caused more butchering of the comb. Comb is soft and delicate. The bees will put it back together, but still, be careful not to mash the cells shut. Add frames and churn. This is the fun part! A good churn in one direction, then churn in the opposite direction, flip the frames and repeat. 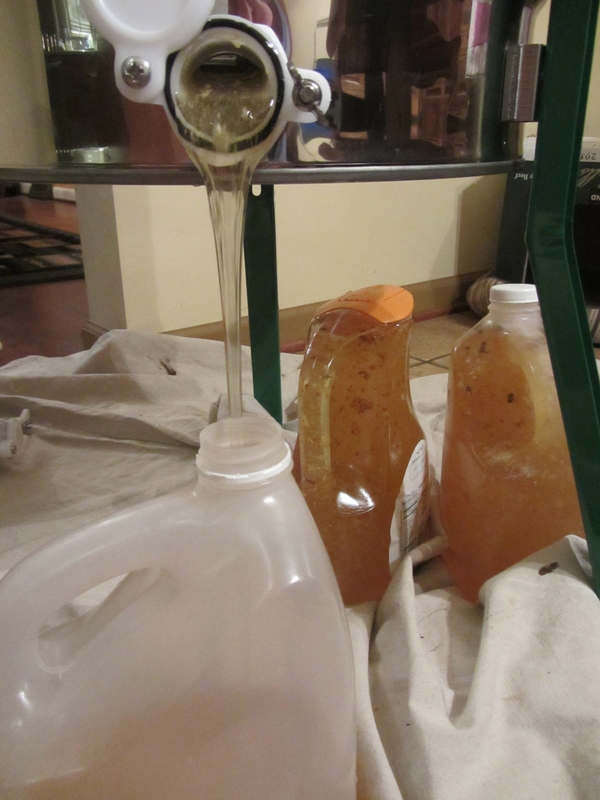 Honey accumulates at the bottom and when it reaches a certain level, drain the tank. I can tell you, the even though it wasn’t honey for us to eat, it was still tasty and unbelievably satisfying to see how much real honey our girls had produced. 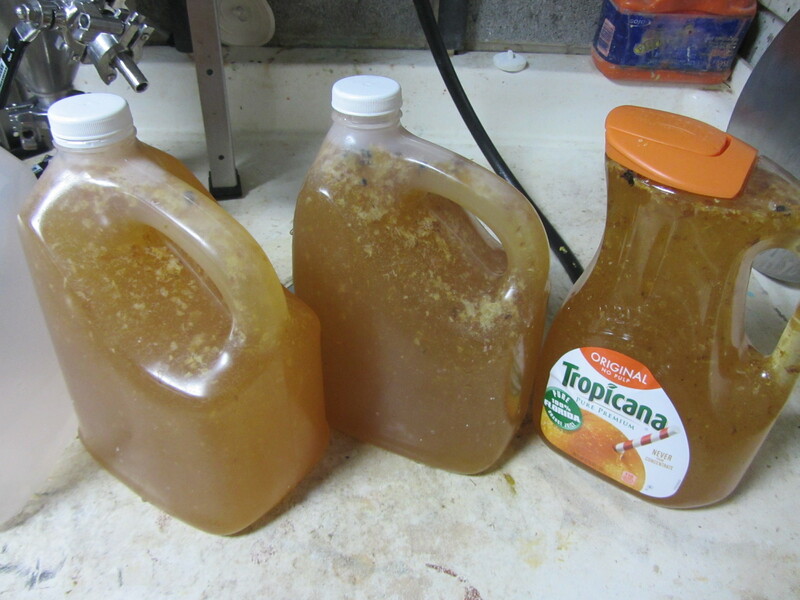 I had cleaned and sterilized gallon jugs ready to go. Be sure your containers are dry. Again, no water in the honey. Because this was going to the bees, I didn’t bother to filter and released the honey directly into the containers. Truth is, I ended up filtering anyway before feeding. 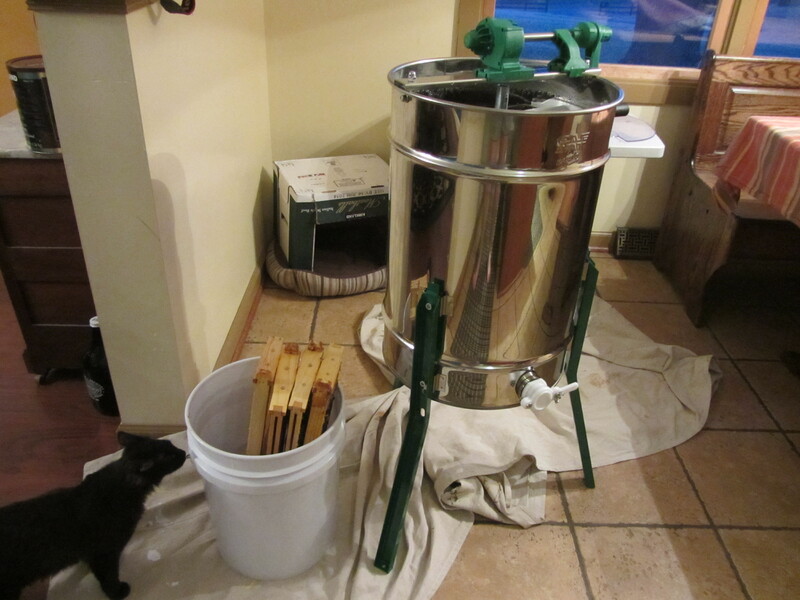 So lesson learned, add one more step and filter the honey from the extractor through a filtering cloth and into the 5 gallon filtering bucket. THEN filter it into containers. 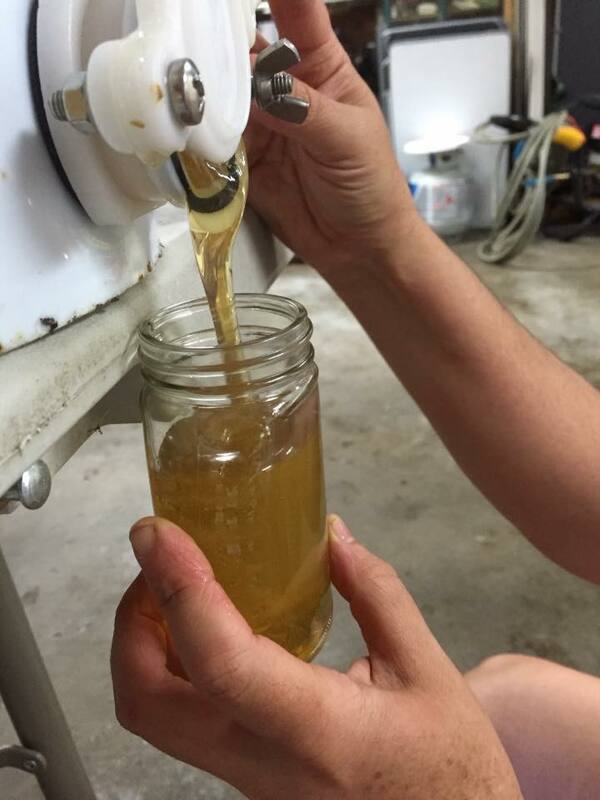 The filtered honey won’t clog up your feeders, and you’ll have more wax to clean up for lotions and potions. Cappings make the best quality wax. Allow them to drain in the uncapping tank then put them in a plastic bag and in the fridge til you’re ready to clean it up. Also, you’ll be amazed at how much honey has collected in the bottom of the uncapping tank after the wax cappings have drained. Mount the extractor onto a more solid surface so it doesn’t shake or wiggle while churning. Dedicated extracting equipment will make life easier – pitcher, knife, towels, containers, etc. No mite treatments when supers are on. I didn’t think of my supers as supers, so it didn’t occur to me to remove them when treating for mites. As a result, the sugar syrup and comb smell of thymol. 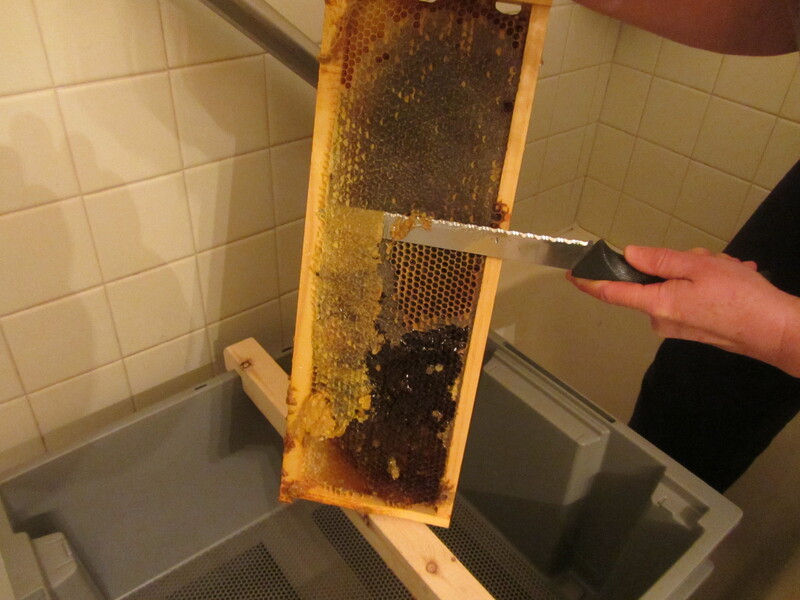 I’m told the smell will dissipate, but I don’t want my honey to have any taste of thymol, so I’ll either use fresh spring drawn comb in my supers this year, or new foundation. I will use 7 frames in my supers so the bees draw out thicker comb. Thicker comb will be much easier to uncap because it will extend farther outside the frames. Another reason why beekeepers extract in the summer – the equipment can be left outside and the bees will be much more active and willing to clean it all up for you! Uncap and extract in the garage – this is not an indoor job. To feed back to the bees for spring, I’ll just add water and mix well to achieve a 1:1 consistency. 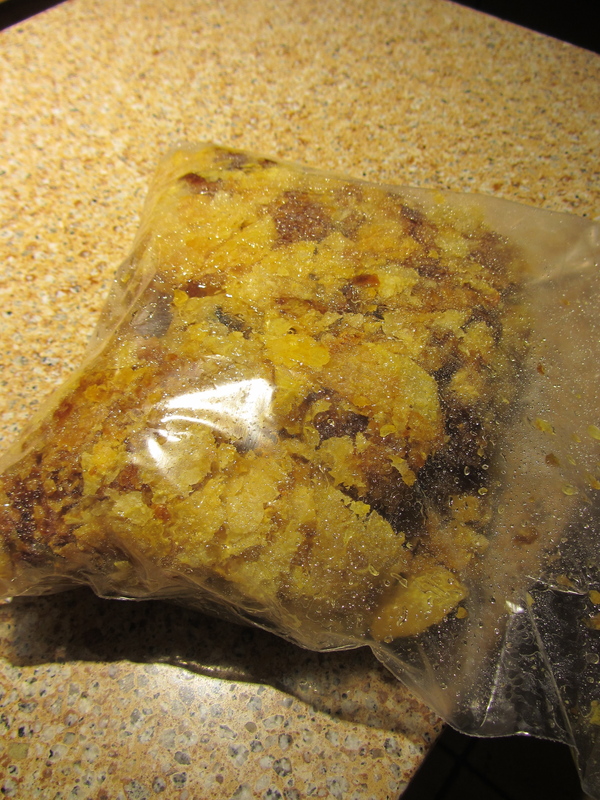 For now, the syrup is going into quart size ziplock freezer bags. I set a bag on the top frames of the hive, stick several times in the top using a sewing pin, and let the bees enjoy their nectar in hopes it will stimulate their spring activity. Thanks for sticking with me through this post. I know it’s a long one, but extracting is a process that’s worth documenting. It’s a sticky job, but someone has to do it. I personally cat wait to do it again with real honey!